We are going to be more explicit and to work out some simple examples/exercises about elementary finite and infinite groups in this post. If we choose the matrix multiplication as group multiplication, then the group is a group. The same set, with the operation “addition of matrices” is NOT a group. This is left as an exercise for you. It satisfies , where the determinant is defined to be (of course, a little of linear algebra is assumed to be known) . iv) The associative law holds for matrix multiplication and thus is a group (of matrices). Example 4. The set , with defined by is a group. It can be easily proved checking that the neutral element is and the inverse is . Example 5. The sets , , , are abelian groups. This group is in fact abelian (something that it is NOT generally true with 3D or higher dimensional “rotation groups”). It can be easily proved that the composition of 2 different matrices of the above type is another matrix of the same type, and that the inverse or the unit element exist for every continuous and differentiable function f of two arguments. The neutral element is in fact and . In this case, the inverse element and the composition function are not “so easiy” as in the 2D case but they can be computed if you are patient and careful enough in a straightforward way. In particular, the composition rule for 3D rotations is NOT symmetrical in its arguments, and it shows that the group is non-abelian (although it has abelian subgroups, of course). The composition rule with this parametrization is in fact very simple and it is related to hyperbolic trigonometry. i) Using the Lagrange theorem, as 1,2,3 and 5 are prime, we do know that there is only one group of each class, the respective cyclic group with 1, 2, 3 and 5 elements. ii.1) The so-called Klein’s group. ii.2) The proper cyclic group with 4 elements. i) The group . It is an abelian group . ii) The group is a group if and only if (iff) is a prime number. Example 13. Congruences (III). Write down the Cayley tables for if . Example 14. Permutation groups, sometimes denoted by . This group is the (sub)group of the symmetrical group formed by the permutations of elements of a set of n-elements. Note that the group of all permutations of a set is in fact the definition of the symmetric group. Then, the term permutation group is usually restricted to mean a subgroup of the symmetric group. The permutation group is the group formed by those elements that are permutations of a given set. Example 15. The translation group in space. In every vector space, it forms an (abelian) group. Example 16. Translation group in spacetime. The same as before, but in spacetime. 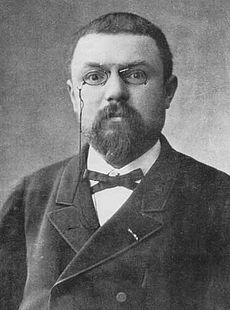 Translations and Lorentz groups in space-time together form the so-called Poincare group. where A,B, C and D are generally real, complex numbers or “similar numbers” with . i) . The general linear group. It is a continuous group with parameters. 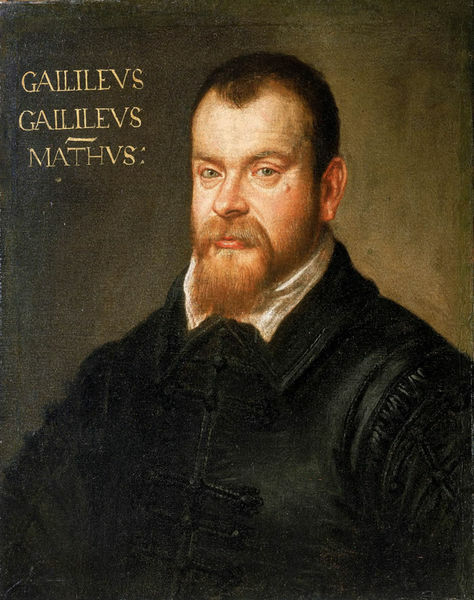 Generally, it is understood that the matrix is non-singlular in order to have a well-defined inverse element. Then, . ii) . 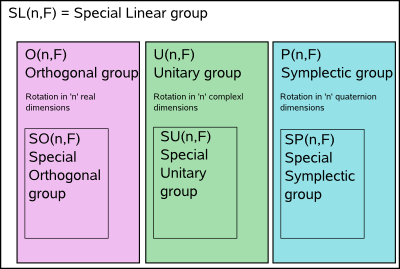 The special linear group. It has parameters over the field. They are the subgroup of with determinant equal to one. iii) . The unitary group. It is formed by complex matrices that verify the property , where denotes “adjoint” and transposition (the so-called hermitian conjugate by physicists). It has complex parameters, or real parameters if you count in terms of real numbers. iv) . The subgroup of the unitary group formed with unitary matrices whose value is equal to the unit. in this group. Its number of parameters is given by . The number of real parameters doubles it to be . v) . The group of orthogonal matrices over the real numbers in euclidean space. It has real parameters(generally “angles”). Any orthogonal matrix satisfies the property that . The group is the subgroup of formed by orthogonal matrices of unit determinant. The special orthogonal group has the same number of real parameters than the orthogonal group. This version of the symplectic group is sometimes non-compact (and it is important in classical mechanics). There is another “symplectic” group, the group . It is the subgroup of quaternionic matrices GL(n,H), invertible quaternionic matrices (I am not going to explain the quaternions here this time). It is compact and formed by any matrix nxn over the quaternions leaving the hermitian form . Then, the compact symplectic group can be related to the unitary group with some careful analysis on the number of parameters of the hermitian form. May the group theory be with you!